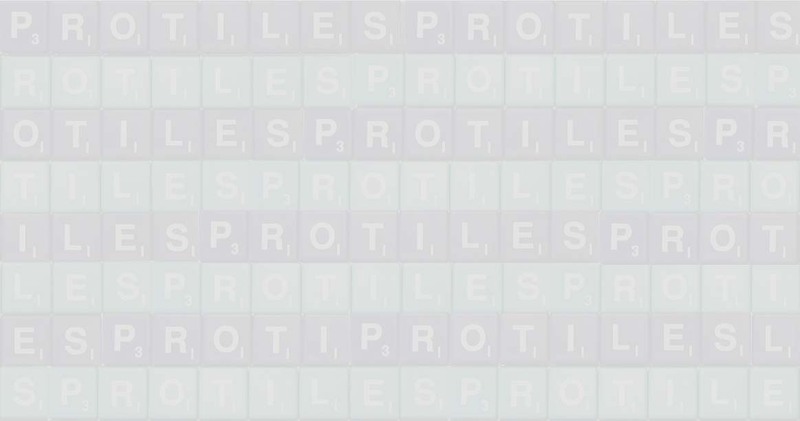 The minimum order quantity for customized Protiles is 200 sets of each customized style. We work with you to make your custom idea a reality. Typically, we can get samples of the custom tiles to you in about 30 days from the date we have worked out your custom requirements. At the time you approve the samples, we ask that you give us a 50% deposit against the order and then pay the balance within 30 days of your receipt of the custom Protiles. 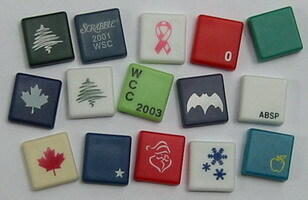 Currently, the price for custom Protiles is USD $18.00 per set. Protiles pays the shipping charges to one destination. Please don't hesitate to contact us if you have any questions. Over the years we have supplied many individuals and organizations with customized sets of Protiles that have helped to promote their goals and commemorate their events. 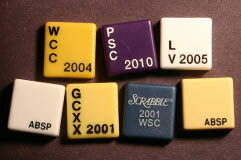 You can choose from a wide variety of colors for your tiles and the printed letters. Obviously, it's best to choose contrasting colors for the tile and the lettering. Look at our Current Styles, Vintage Styles, or Discontinued Styles pages for ideas. 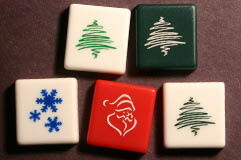 Customize your blank tiles with tournament-specific info, special clip art, etc. Note that any images or artwork must be either your original artwork, public domain artwork (clip art), or artwork for which you hold the copyright. See below for some examples. 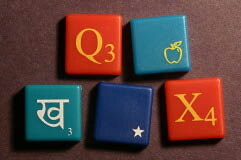 Tell us which language you want and we will make the tile set with that language's letter distribution and tile values (in addition to English, Protiles have been made for Spanish, Hindi, Swedish and Latin). Contact us by email for a quote on a custom order.